Bet you didn’t know those orange and black-clad bodies in Ōtaki’s Memorial Hall on a recent Saturday were the Whenua Fatales Roller Derby League. You could’ve found out all sorts of exciting stuff about this group of enthusiastic skaters, and heaps more, at the Ōtaki Community Expo. Organised by Ōtaki Promotions Group to showcase their services, the Expo’s aim was to inform local people of the wide range of support, health and education groups, sporting, leisure and service clubs, and also the various environmental organisations, in their community. The Ōaki Community Expo was first held in 2012 and has gone from strength to strength, attracting increasing numbers. More than 30 stalls filled the hall this year and many attending were awarded prizes for visiting sites. Former policewoman, Sonya Sloan, of Kapiti Coast Older Persons’ Council, was passionate about her council’s work. She said it was important to recognise and celebrate older people, to improve their wellbeing. For those with a hankering to work with young people, Scouts NZ were on the lookout for volunteers. Various roles were available within the organisation, and mentoring and training is provided while you develop those leadership skills you never knew you had. Visitors from outer space, or Bee club recruiters? We’re all worried about our bees and Ōtaki’s The Buzz Club welcomes new beekeepers. The club aims to promote beekeeping (for pollination and honey production) and will give newbies “every assistance to achieve that.” Beekeepers on site were kept busy with ‘bee talk’, but they also have practical field days for hands-on learning. It was good to note the Seasonal Surplus Stall is starting again on Thursday, 8 October (the stall buys your surplus fruit, veggies and eggs and you get 80% of the sale price). Transition Town Ōtaki also offered information about Timebank (a way of trading skills in a community – you use time rather than money). 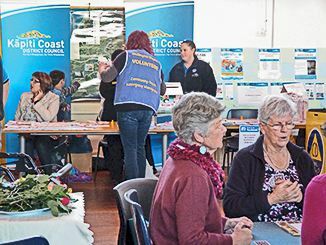 Volunteer Ōtaki was busy “creating community connections,” and for those wanting to research local and family history there was plenty of help available at the Ōtaki Historical Society stall and the Ōtaki branch of the New Zealand Society of Genealogists.